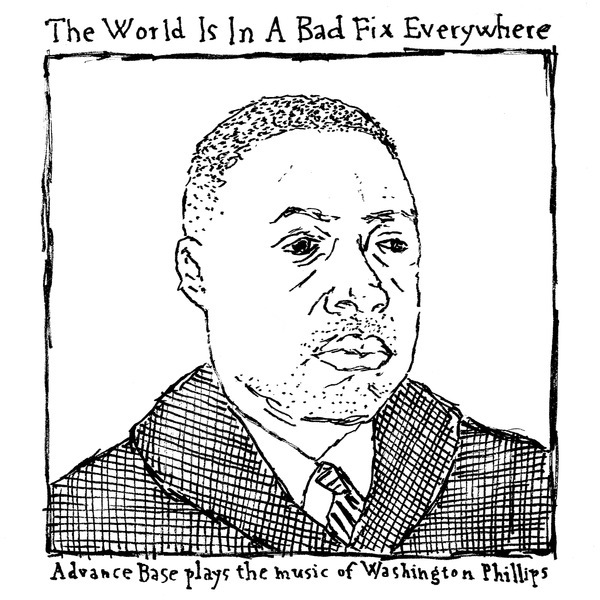 Following the critically acclaimed debut album, A Shut-In’s Prayer (#19 on MOJO Magazine’s Best Albums of 2012< list), Advance Base returns with a tribute to early 20th century Texas street preacher, singer, songwriter & musical innovator Washington Phillips entitled The World Is In A Bad Fix Everywhere. Washington Phillips only recorded eighteen songs during his short career as a professional recording artist, & only sixteen of those recordings exist today. Mystery surrounds Washington Phillips’s music, as there is no known documentation of how it was made. For many years, it was believed that he performed his songs on a tiny, piano-like instrument called a dolceola, but many scholars now believe that Phillips custom modified two celestaphones (archaic, zither-like instruments), which he played simultaneously in his own special tunings. The strange, angelic sounds of strummed & plucked strings that accompany Washington Phillips’s forlorn spirituals have made him a legendary figure in gospel & outsider music circles. 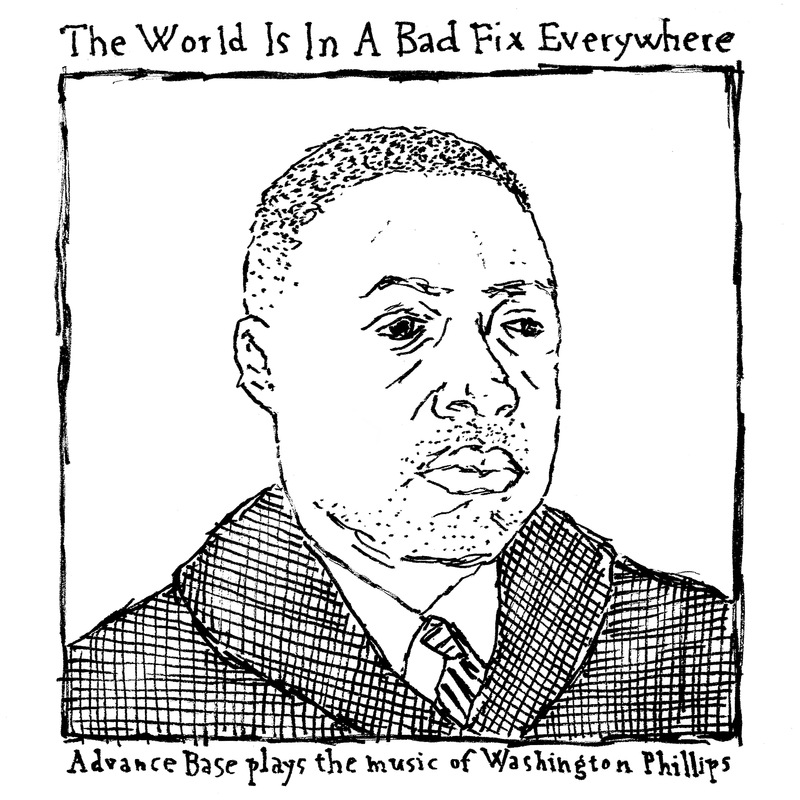 The World Is In A Bad Fix Everywhere, Advance Base’s Owen Ashworth has arranged a selection of Washington Phillips’s compositions for autoharp, piano, electric piano, drum machine & voice. Phillips’s unique, beautiful melodies & heartbreaking lyrics are a natural match for Ashworth’s raw, inventive production & doleful singing voice. Performed, recorded & mixed solely by Ashworth at his home in Chicago, Illinois, these tracks stretch the sound of Advance Base in new directions while paying tribute to one of Ashworth’s greatest influences. The World Is In A Bad Fix Everywhere showcases elements of gospel, psychedelic rock, traditional Americana, alt. country & lo-fi outsider art. The World Is In A Bad Fix Everywhere was mastered by Timothy Stollenwerk, the same engineer who mastered a posthumous vinyl reissue compilation Washington Phillips’s original recordings entitled What Are They Doing In Heaven Today? The World Is In A Bad Fix Everywhere was included in the Chicago Reader's Best of Chicago 2013 list. The World Is In A Bad Fix Everywhere is distributed by The Business & Mississippi Records.